A person might wonder how long a Nihola can be used for child-hauling. In part, this has a lot to do with what other options you have. 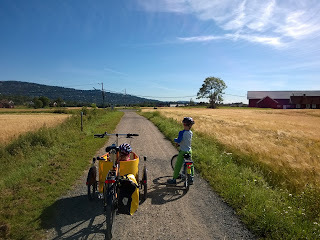 Here in Oslo, its pretty well impossible to take the kids on a bike tour because of the abundance of hills to climb, in addition to the rather hazardous state of the bike path network. So, I had the day off work, two kids, very nice weather... and I wanted to buy some Lego plates from a toy store in Røa, 12km away by car. Needed those Lego plates, and who really wants to drive to get them anyway? 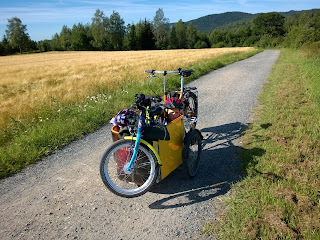 So the main problem is what to do with a 20" wheel bike, a running/balance bike and two kids (7+4) when the hills get steep, or they otherwise want a rest. Not entirely pleasant, but it works. This is what makes a ~24km round trip on hills work. New Nihola owner here: mine has the SRAM s-7 hub and the stock front chainring. I think I'd like the option for a lower gear range -- do you have any recommendations for tooth sizes of the front chainring? Hi, over in this post I have a chart showing gear ratios, its worth a thousand words, more or less. Green lines are what I most Niholas are sold with, as far as I know. Anyway I think its a lot easier to change the rear sprocket than the front chainrain. I would think 24t rear and 38t front would be a very nice setup, however you'll need to remember that an S7 is not invincible. I broke a P5 using 24t & 38t, and I'm not heavy, though I am perhaps abusive. (I broke it trying to climb a hill off the trails in the forest.) The S7 is probably a little weaker than the P5. The Shimano Nexus 8 appears to be better with high torque. I've got one of those with 24t & 38t which I have abused quite a lot without issue. The S7 was geared way too high when using 19t and 38t as it was sold, the top 2 ratios had no realistic purpose, in my experience. I also have the Sram 7 setup. And I live in southern Sweden, basically as flat as Denmark. Gears 6 and 7 are seldom in use even here. 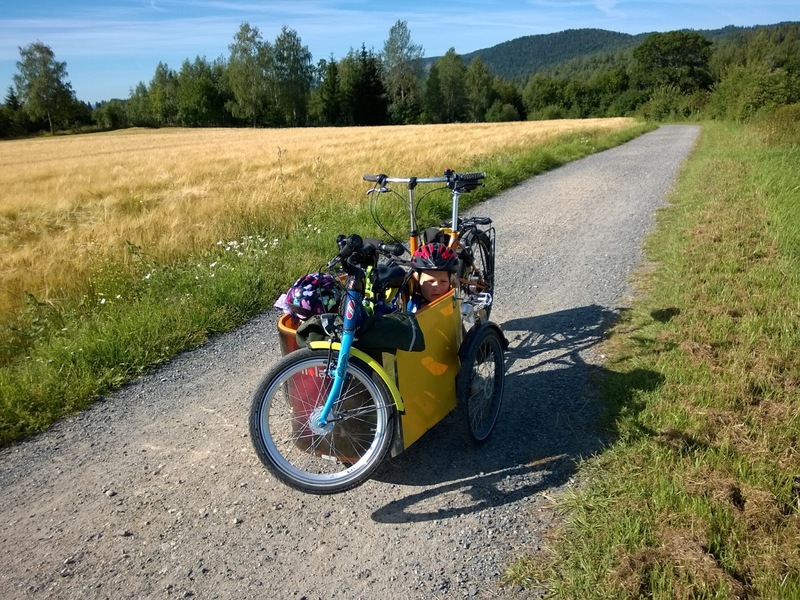 I know this is sort of an old post, but I've been running a 22t with 33t chainring on my trike with a nexus 8. It hasn't destroyed itself yet, and that's with climbing a hill where I had to put my entire weight down in 1st gear to go up (I was worried a bit that it would get mildly steeper and I would have to take a several km detour). Also I have taken it on some mountain bike trails, but I never rock it back without hitting the brakes in between as I am a little afraid of the increased force when doing such. 24/38 = 0.63, 22/33 = 0.66 so similar but not worse. Depending on how much you weigh, you're quite possibly still fairly safe with that ratio. Mine doesn't even show signs of wear on 1st gear after 4 or 5 years now. A crude design in many ways, but that reduction gear is solid.